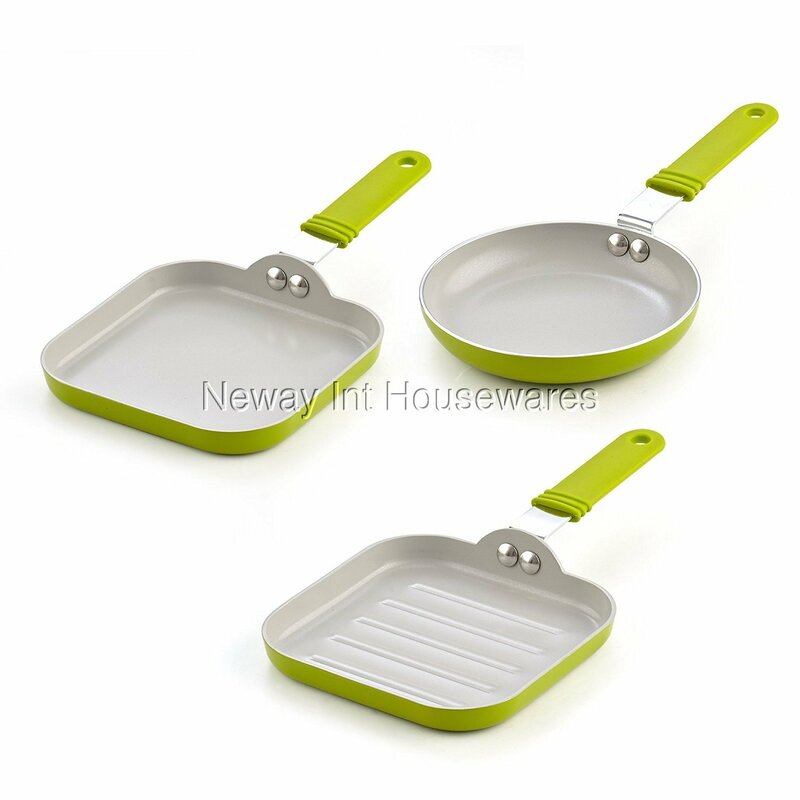 ​The Cook N Home 3 Piece 5.5-Inch Nonstick Ceramic Mini Fry Pan, Griddle, and Grill Pan Set, Green includes 5.5-inch: mini size one egg fry pan, square toast griddle pan, and a square grill pan. Made of thick gauge aluminum that provides even heat conduction and prevents hot spots. Nonstick ceramic coating for easy food release/cleaning and allows for healthy cooking. PTFE, PFOA, cadmium, and lead free, and scratch resistant. Soft touch anti-slip handle stays cool and comfortable and has a hole for hanging. Exterior color paint is resistant to high heat and easy to clean. Small size to save space and for small kitchens. Light in weight and has a sturdy handle for moving/flipping. Works on gas, electric, glass, ceramic, halogen, etc. Not Induction compatible and not oven safe. Dishwasher safe.